Our PI Cheryl Hodgkinson-Williams was invited to the Regional Consultation Conference on the World Bank’s “World Development Report 2016” in Nairobi, Kenya from 26-27 January 2015. Below she takes us on a whirlwind tour of the event, its aims and her contribution to the consultation. 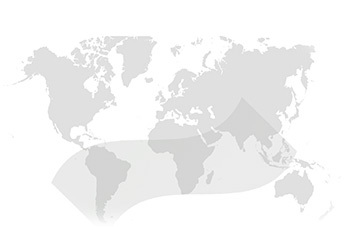 The World Bank produces an annual report focusing on a particular aspect of development each year. The theme for 2016 is “Internet for Development”. The Report will explore the internet’s impact on economic growth, on social and economic opportunity, and on the efficiency of public service delivery, with a view to help countries better leverage the internet for development. This will involve the identification of policy reforms not only in the information and communication technology sectors but also more broadly in various related sectors and in the development community. In my capacity as Principal Investigator of the ROER4D project, I was invited to attend and contribute to this important project. This proved to be an enlightening experience and invaluable networking opportunity, where I was able to share not only our project’s activities, but also the potential of open educational resources (OER) as contributing to the Internet for Development agenda. A particular highlight was the opportunity to meet the Co-directors of the World Development Report (WDR) 2016, Deepak Mishra and Uwe Deichmann, the WDR contributors and particularly the fascinating range of government officials, researchers, business executives, entrepreneurs and consultants from Africa. I travelled from Cape Town to Nairobi with fellow researcher, Adjunct Professor Alison Gillward from the University of Cape Town’s Business School and Executive Director of Research ICT Africa. This gave me some time to better understand the contribution of the International Development Research Council (IDRC) funded Research ICT Africa project to ICT policy and regulatory research. The value of the Research ICT Africa project to the ROER4D Project became clear during the session where Alison reviewed ICT policy and infrastructure in Africa (See Research ICT Africa’s Papers and Publications for detailed reviews). At the start of the meeting, Victor Kyalo, the first CEO of newly restructured Kenya ICT Authority highlighted technology as one of the most influential factors in Africa’s growth. As a founding member of Kenya Education Network (KENET), Kyalo reflected a keen appreciation of the role of technology in providing access to quality education in addressing what he referred to as the “youth bulge” in Africa. Some of the challenges that Kyalo highlighted included connectivity, cost, the availability of broadband, digital literacy in and out of government, infrastructure, governance of the Internet and cybersecurity. From a ROER4D perspective, he alerted us to the issues that need to be addressed in order for technology to provide the platform to open educational resources. The meeting then proceeded around four focussed sessions with invited speakers opening the debate and presenting their points of view. In Session I: Making the internet universally accessible, affordable, open, safe and sustainable Tim Kelly, Lead ICT Specialist in the WDR team, highlighted the themes of affordability, transparency, privacy and sustainability. These themes were elaborated upon by Michael Mingers, who suggested that mobile broadband would be the key technology to support development in Africa. Saidou Yanogo, Director General of the Ministry of Digital Economy in Burkina Faso, did not agree with Mingers and suggested that fixed broadband might be more important for long term growth in Africa. Francis Hook of GSMA in Kenya made a very strong argument for the role of mobile technology in supporting development in Africa and highlighted the importance of access to the internet from moblies in two GMSA reports, Mobile Economy Africa and Digtial Inclusion. Tusu Tusubira, CEO Ubuntunet, Uganda concluded this session with a salutary reminder of the need for more technical competence and more locally relevant content – the latter implying a call for educational content, including OER. In Session II: Internet, Economic Growth and Poverty Reduction Alison Gillwald re-emphasised that “content drives the internet” while Kofi Dadzie, COE Rancard Solutions, Ghana made a plea for government policies to minimize costs that affect adoption and use of mobiles. Dorothy Okello of Women of Uganda Network raised the issues that many women face in many parts of Africa where their spouses may not permit them to use mobile devices as well as the challenge of charging mobile phones even if they do have access to a mobile device. Lukonga Lidunda of BongoHive, an incubation hub in Zambia, described their collaboration with budding entrepreneurs and highlighted their use of Slack for team communication. In Session III: Internet and public service delivery I presented a brief explanation of the value of open educational resources and the alternative licensing mechanisms such as Creative Commons to assist creators to share educational content legally. 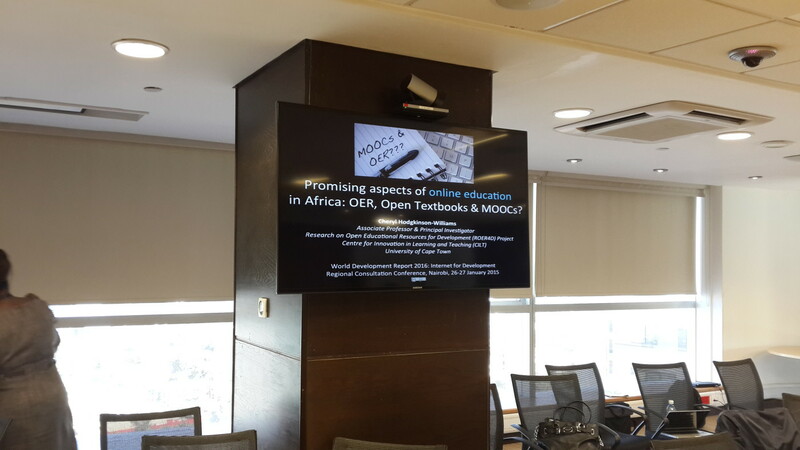 I highlighted OER initiatives from Africa (e.g. AVU, OER AFrica, OpenUCT, AfriVIP, TESSA), some OpenTextbooks (e.g. 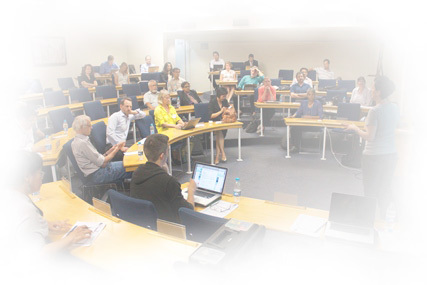 Siyavula, Electric Book Works and emerging MOOCs (Medicine and the Arts – Humanising Healthcare). While some in the group seemed to know about Creative Commons, it appears that I was the only presenter to make my presentation freely and openly available online, indicative perhaps that the concept of OER has not yet gained sufficient traction to make sharing of publicly influential information a common practice. In Session IV: Are digital technologies enabling Africa to leapfrog?, Nivi Mukherjee, co-founder and CEO of eLimu presented an inspiring overview of how they invented a computer tablet with an educational programme, named eLimu, to engage children as a teaching aide with videos, diagrams and quizzes. They draw on existing OER and incorporate them into the growing range of materials they offer learners. Erik Hersman, Co-founder of Ushahidi, iHub Nairobi, BRCKnet and SavannahFund provided a lightning fast overview of the range of innovations in which he and his team have been involved and ending the consultation session on a high note! We will have to wait for the “World Development Report 2016” to be published to see exactly how this Consultation Event in Nairobi fed into the final report!